Academy Award nominations were announced this morning and Toy Story 3 led the charge for Disney, getting five nominations including Best Picture and Best Animated Feature Film. Tim Burton's Alice in Wonderland received three nominations for Art Direction, Costume Design and Visual Effects. There were a few surprises for Disney, as Tangled failed to receive a nomination for Best Animated Feature Film. With only three slots available, the Rapunzel fairy tale was bumped by the French film The Illusionist. The remaining nomination went to Dreamworks' How to Train Your Dragon. Tangled's only nomination was for Original Song ("I See the Light"). Another surprise was Tron: Legacy only scoring a single nomination for Sound Editing and getting shut out of Visual Effects and Original Score. Disney/Pixar was also honored in the Best Animated Short Film category for the very clever Day & Night. 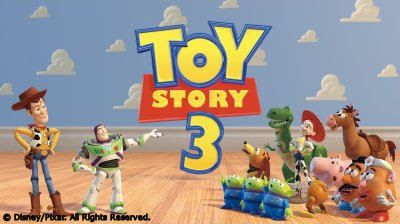 Toy Story 3's other nominations were for Adapted Screenplay, Sound Editing and Song ("We Belong Together"). The song was written by Randy Newman, who received his 19th Oscar nomination. Newman's only previous win was for Best Song for "If I Didn't Have You" from Monsters, Inc.
Of Toy Story 3's five nominations, director Lee Unkrich's only comment on Twitter was "Speechless." The Oscars will be presented in Hollywood on February 27. I don't necessarily think it's a surprise that "Tangled" wasn't nominated for a Best Animated Feature Academy Award. It's a good film, but not a great one. It's not the kind of film that sticks with you after seeing it. I'm surprised that one of it's songs was nominated as I don't remember a single tune from it. I am as surprised as you to see that "Tron: Legacy" failed to pick up a Best Score nomination, especially with how Disney was advertising Daft Punk's score as a highlight of the film, which it was. "The Illusionist" had gained a lot of momentum from critics, but "Tangled" still seemed to be a lock for a nomination. In the end, though, "The Illusionist's" nomination is consistent with how the Academy likes to honor "artsy" animated films. It's this year's "The Secret of Kells," or, for that matter, "The Triplets of Belleville," which was also directed by Sylvain Chomet. I Can't Blog, I'm Too Excited!